We decided to get away from Sunnyvale once in a while. So far, we spent most of our weekends going grocery shopping, dining and driving within Sunnyvale only. Thus, we decided to drive to San Jose in order to try Vietnamese cuisine for our first time since we moved here. According to Wikipedia, San Jose is the third-largest city in California. It is commonly known as Silicon Valley and is located a 30 minute's drive to the South from Sunnyvale. A majority of Asian Americans live there, hence we can find a variety of Asia's cruisine such as Chinese, Korean, Japanese, Hong Kong, Vietnamese, etc. On top of that, Santana Row is a popular shopping mall, located in San Jose as well. Most of the brand-name clothing and accessories can be found there. I haven't been to Santana Row yet but I heard a lot of good reviews about this shopping mall off of the internet. I hope I can visit Santana Row someday. 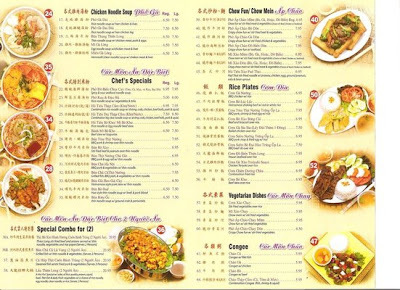 It was not easy to find a well-known Vietnamese restaurant within Sunnyvale and San Jose. 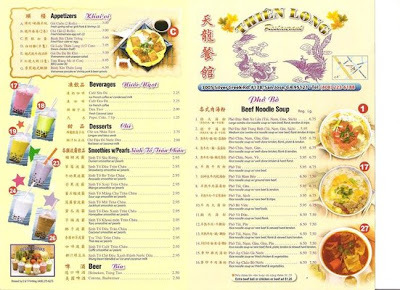 Many of these restaurants offered Vietnamese noodle soup which were not our favorite dishes. William preferred to get some typical Vietnamese rice dishes. We managed to find a Vietnamese restaurant which served noodles and rice dishes after spending 20 minutes of internet research. I never realized that it was a long drive to this Vietnamese restaurant. Our GPS system guided us to two highways which were US-101 S and Capitol Expressway. If we missed the exit at Capitol Expressway, we would be heading to Los Angeles instead. As we reached the exit of Capitol Expressway, the lane was very congested with vehicles. We crawled for 10 minutes before reaching the traffic light at West Tully Road. We saw many Vietnamese shops on our left and right sides. We perceived this small town as a Vietnamese Town. How did we know they were Vietnamese shops? We couldn't read the words but we could recognize the characters. Anyway, we finally reached the restaurant which was located just outside of town. There were some sufficient parking lots outside the restaurant. It was read as Thien Long Restaurant. As we walked into the restaurant, it reminded me of the typical small Chinese restaurants that I had been to in Malaysia. A waiter came to serve us. We were seated and given the menu as below. We also got the complimentary Chinese Hot Tea. After looking at the menu for some time, William decided to get a can of coke while I had a can of soya bean milk. This was my first time seeing Yeo's brand in California. Yeo's is the popular drink brand in Malaysia and Singapore. We really enjoyed our lunches very much. It was a huge portion and cheap too. Our bill came up to the total of US$25 for all the above meals and drinks we had. There was a slight difference in services between this restaurant and other restaurants. The waiter/waitress would not get the bill for you. You have to walk to the cashier's counter and pay your bill by cash. Moreover, you do not have to tip, which gives you an advantage of savings if you come with a group of family members or friends for lunch/dinner or meals in general.